When David Adelman 89L describes his role as the Georgia Senate minority whip to his son’s fourth-grade class, he knows just how to explain it so they will understand. “It’s kind of like being the line leader,” he says, with all the confidence of a father of three. Elected a state senator in 2002, Adelman enjoyed membership in the majority party for just a few days before four Democratic legislators switched sides, giving the Republicans control of the Senate for the first time in a century. It was also an opportunity for Adelman, a partner with Atlanta law firm Sutherland, Asbill, and Brennan, to step up his leadership. Two years later, he was voted the Democratic whip by the Georgia Democratic Legislative Caucus. Adelman’s district of 150,000 Georgia residents includes Emory and the surrounding Druid Hills community and also reaches to the burgeoning immigrant population along Buford Highway. Despite the contentious political climate in which he was elected, Adelman has pointedly focused on bipartisan issues. His key legislative initiatives include a law that allows for prisoners to have a new trial in cases where DNA evidence supports it—a measure that later helped Emory law student Jason Costa 99C 06L assist the Georgia Innocence Project in freeing Clarence Harrison, a wrongly convicted man. 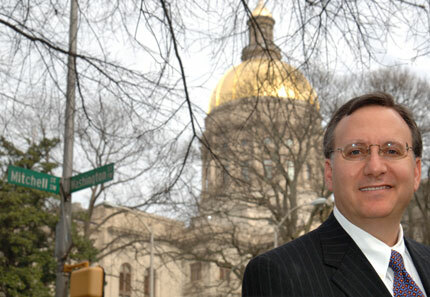 Adelman has worked on legislation on behalf of disabled Georgians, successfully authored the Family Violence Shelter Protection Act of 2004, and helped craft a bipartisan bill supporting stem cell research. He keeps close tabs on legislation involving public schools, jobs, traffic, and health care. “My experience has been that if you put your mind to it, you can overcome partisanship,” he says. As minority whip and second-in-command to the minority leader, Adelman is the go-to guy for Senate Democrats. He has to be on top of the legislative calendar, have thorough knowledge of the Senate rules, count votes, and organize his fellow legislators when the Democrats are to take a unified stance on an issue. “It adds a lot of obligations, but it also puts me in a great position to help my district,” Adelman says. Raised in Atlanta, Adelman first visited Emory School of Law as a junior in high school, when his class was asked to serve as jurors in the moot court competition. It was his first exposure to the law, and he was immediately captivated. Five years later, after graduating from the University of Georgia, Adelman entered the same building as a first-year law student. He has since served as president of the Emory Law Alumni Association and is currently a member of the Law School Council and the Emory Public Interest Committee advisory board. Each year, Adelman and his wife, Caroline, host a reception for the school’s newly admitted students; and he actively recruits Emory law graduates to his firm, where the most senior partner is Randolph Thrower 36L. Adelman and his family live near the University campus on Emory Road and often stroll to the Quad on walks together. “My strongest memories of law school all involve the classroom experience and my introduction to the Socratic method in my first year,” he says. “The law school trained me to always consider the unintended consequences of legislation. That way of thinking serves me well as a lawmaker.”—P.P.P.